Order 844 Numbers Now. Get 844 Vanity Numbers While They Last! Toll Free 844 numbers were first released by the FCC on December 7, 2012. 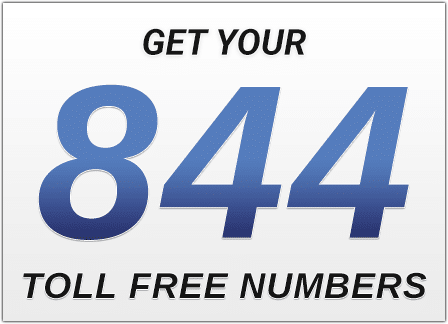 The good news is there are still thousands of 844 toll free numbers available for instant purchase here at UniTel Voice. We have some great hand-picked 844 phone numbers reserved for our customers that you can use at no extra cost when you sign up for a UniTel Voice account. We also allow you to search the FCC’s national database of spare numbers, where you can find and instantly buy a custom 844 vanity number for a $15 one-time fee — one that spells a specific word related to your business. Important note: When you sign up for UniTel Voice and select a toll free number, you own that number. Even if you’d like to cancel your account, you can keep your number and transfer it to another phone company at any time — no strings attached. 1. 844 numbers are toll free just like 800 numbers are. The most commonly recognized toll free number is the classic 800 number. For over 30 years 800 numbers were the only toll free numbers a business could use. Then in the 1990s, the popularity of these numbers skyrocketed and in an effort to keep up with demand the FCC released a serious of new toll free number prefixes including 888, 877, 866, 855, and 844. Most recently the FCC has released toll free 833 numbers and is scheduled to release 822 numbers. But the point remains, there’s no difference between these numbers and traditional 800 numbers, they are all toll free phone numbers and they work the same way. As a startup, anything that can give your business an edge on the cheap is a good thing. Using a toll free number, whether it be an 844 number or otherwise, gives your business a nationwide presence and the flexibility to grow. If you move to a new location, expand your team, or change your business phone system, you can take your toll free number with you. Toll free numbers allow you to forward calls to multiple phones, use virtual voicemail, and even time-of-day call routing. You can track calls, record calls, and even use voicemail-to-text to transcribe your caller’s messages into an email. That flexibility, features, and benefits are endless. And it’s easy-to-set-up, easy-to-use, and has never been more affordable. Amazing telecom technology and call quality on the cheap. And even though true 800 numbers are the most recognized business phone numbers, using an 844 toll free number can still give your business credibility. Especially if it’s a branded vanity 844 number. If you watch TV for 20 minutes, you’ll see several Fortune 500 companies (or larger) advertising their 844 numbers. They’re widely used and just as good. 2. Custom 844 numbers are a good choice if you’re looking for a vanity number. As we stated above, 844 numbers were released to satisfy the demands of a shortage of good toll free numbers. Because 844 numbers are newer than other toll free prefixes there are more of them available in the FCC’s spare pool, and thus, more options to find a vanity phone number that spells a specific word or phrase related to your business. You can use our custom toll free search on signup page to see if the vanity 844 number you’d like to use is available. We have access to all available 844 numbers not currently in use with other companies and you can search all available numbers in real time. If the number you want is not available, our search tool will provide you with a few closely related numbers that are available for instant purchase. And if you still can’t find a good number, give us a call or chat with us online and a customer support rep would be happy to personally assist you in finding a great number. We’ll help you brainstorm some keywords and phrases related to your business’s brand, industry, or value proposition, we’ll do a search, and we’ll send you a list of available numbers for which you have no obligation to buy. We won’t hold numbers hostage either. And if you decide to buy an 844 number or any phone number from us, remember you own that telephone number with no strings attached. You can port your number away from UniTel Voice to another provider at any time. 3. When you get an 844 number from UniTel Voice you’re getting more than a phone number. Not only will we help you find a great number, with UniTel Voice you get all the features you need to run your business from anywhere on any phone. UniTel Voice’s cloud-based phone system allows you to forward your toll free number to any single or group of phones, extensions, or voicemail. You can set up an auto attendant to greet and route calls or simple forward your toll free number to any existing line. Whether you’re a big call center, a small remote-working team, or a solo entrepreneur, UniTel Voice smartphone app gives you the power of a professional business phone system in the palm of your hand. And whether it’s pricing, features, call quality, or customer service, we’re confident that UniTel Voice has you’re looking for or your money back. You can manage your virtual phone system completely online but we’re here to help you get up and running as fast as possible. We’ll help you set up your greetings, call forwarding extensions, and voicemail. We offer free a professional voice studio where you can use a voice talent of your choice to professionally record your greetings, so you and your business sound more professional and impress customers when they call. Our 30-day risk-free trial is as straightforward as it sounds. Our customer support is what sets us apart, but if you’re not happy in your first 30 days of service, we’ll refund your money—no questions asked. And if you decide you’d like to transfer your number to another toll free service provider, you can port your number with no strings attached. With UniTel Voice you own your phone number.